Years from now, when we look back to New York City's colorful 2010ish history, this plush hotel will be a spot we will remember. 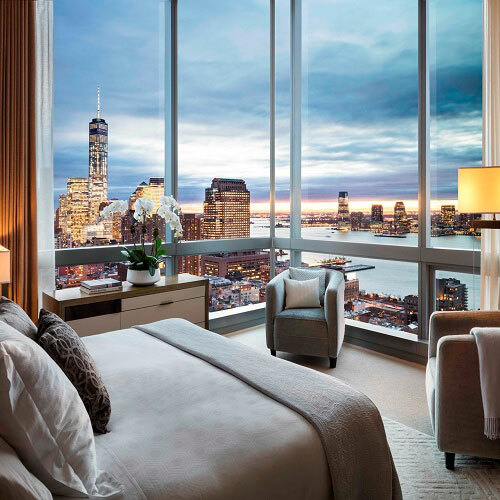 With stellar views of the city from the higher floors, this bastion of contemporary luxury features swanky modern Italian furnishings, impressive artworks and marble bathrooms. Guests will be pampered by the doting staff at the pool on a rooftop terrace and spa. The SoHo location puts you at the very heart of Manhattan's fashion culture, a short walk away from unique, world-class shopping opportunities and myriad fun restaurants and bars. Smoke free premises. 391 units, some two bedrooms. 46 stories, interior corridors. Accessibility (Call). Between Varick St and 6th Ave (Ave of the Americas). 246 Spring St 10013. Station: Spring St.
refrigerators, microwaves, coffeemakers, pay movies, wireless Internet, safes. Some: high-speed Internet. recreation programs in season, exercise room, spa. valet laundry, room service, area transportation-Lower Manhattan.